Present-day giant pandas (Ailuropoda melanoleuca) are estimated to have diverged from their closest relatives, all other bears, ∼20 million years ago, based on molecular data . With fewer than 2,500 individuals living today , it is unclear how well genetic data from extant and historical giant pandas  reflect the past . To date, there has been no complete mitochondrial DNA (mtDNA) sequenced from an ancient giant panda. Here, we use ancient DNA capture techniques  to sequence the complete mitochondrial genome of a ∼22,000-year-old giant panda specimen (radiocarbon date of 21,910–21,495 cal BP with ± 2σ at 95.4% probability; Lab.no Beta-473743) from the Cizhutuo Cave, in Leye County, Guangxi Province, China (Figure 1A). Its date and location in Guangxi, where no wild giant pandas live today, as well as the difficulty of DNA preservation in a hot and humid region, place it as a unique specimen to learn about ancient giant pandas from the last glacial maximum. We find that the mtDNA lineage of the Cizhutuo panda coalesced with present-day pandas ∼183 thousand years ago (kya, 95% HPD, 227–144 kya), earlier than the time to the most recent common ancestor (TMRCA) of mtDNA lineages shared by present-day pandas (∼72 kya, 95% HPD, 94–55 kya, Supplemental Information). Furthermore, the Cizhutuo panda possessed 18 non-synonymous mutations across six mitochondrial genes. Our results show that the Cizhutuo mtDNA lineage underwent a distinct history from that of present-day populations. As the specimen was found in a subtropical environment, which makes biological preservation and recovery of endogenous DNA difficult, we performed hybridization capture using probes  to successfully capture the complete panda mitochondrial genome from the Cizhutuo specimen (Supplemental Information). We successfully aligned 148,326 fragments to a giant panda mitochondrial genome reference (GenBank: EF212882). After removing duplicated fragments, we obtained 282-fold coverage across the complete mitochondrial genome (Supplemental Information). We verified the authenticity of the ancient mtDNA by finding short fragments averaging a length of 62 base pairs (Supplemental Information) and calculated high C→T frequencies (39–63%) at the end of fragments (Supplemental Information), suggesting high cytosine deamination, a prominent feature of ancient DNA . Finally, we determined that the average support for the consensus base was 98.8%, which suggests that these mtDNA fragments belonged to one individual (Supplemental Information). We conclude that the mtDNA captured was ancient, derived from a single individual, and is likely to be endogenous to this specimen. We reconstructed the phylogeny of the family Ursidae using complete mitochondrial genomes (Supplemental Information) of 138 present-day bears and 32 ancient bears, including that from the Cizhutuo specimen. We verified that the Cizhutuo panda was genetically more similar to present-day giant pandas than other bear species but was placed outside the mtDNA diversity of present-day giant pandas (Figure 1B). Using tip calibration with the 32 ancient bear samples, we estimated a mutation rate for the complete mtDNA genome at 2.22 × 10-8 (95% HPD, 1.83–2.60 × 10-8)substitutions/site/year (Supplemental Information). With this mutation rate, the estimated time of the mtDNA coalescence for giant pandas and other bears was ∼10 million years ago (95% HPD, 12–8 million years ago), which corroborates with the appearance of the oldest specimen assigned to the giant panda lineage, Kretzoiarctos (12–11 million years ago), found in Europe , as well as the oldest specimen found in China at the Yuanmou locality (8–7 million years ago) [7, 8]. 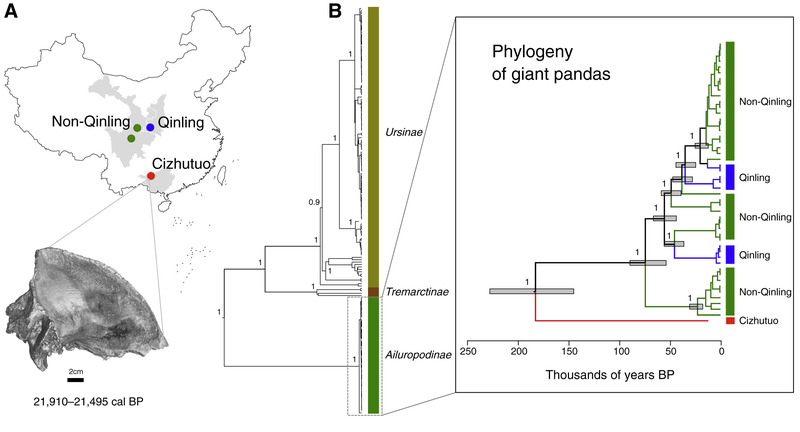 The matrilineal coalescence time for the Cizhutuo panda and the mitochondrial ancestor of present-day giant pandas was ∼183 kya (95% HPD, 227–144 kya), much older than the TMRCA for present-day pandas of ∼72 kya (95% HPD, 94–55 kya, Supplemental Information). These results were consistent when re-estimated using different partitions of the mtDNA coding region (Supplemental Information), and they highlight that the Cizhutuo panda’s maternal lineage had a long and unique history that differed from the maternal lineages leading to present-day panda populations. The Cizhutuo panda is on a distinct mtDNA lineage from present-day populations. (A) Geographic location of ancient and present-day pandas used in this study, along with a computer tomography of the Cizhutuo skull. The Cizhutuo panda (red) was found in Guangxi province, and the present-day giant panda populations, Qinling (blue) and non-Qinling (green), live in Shaanxi, Gansu and Sichuan provinces. The base map of China chart no. GS(2016)1550 was downloaded from the National Administration of Surveying, Mapping and Geoinformation. (B) Reconstructed phylogeny of the family Ursidae (left; 170 individuals) and an enlarged view of the giant panda subfamily, Ailuropodinae (right; 50 individuals), showing that the Cizhutuo mtDNA lineage is more closely related to present-day pandas than to other bears, and that the coalescence between the Cizhutuo and present-day mtDNA lineages is much older than the coalescence between present-day panda mtDNA lineages. Posterior values are the listed numbers, and the 95% HPD are shown as grey bars. For the Cizhutuo panda, we found 46 synonymous and 18 non-synonymous mutations in the mtDNA coding region (Supplemental Information). The 18 non-synonymous mutations were located in the ND2, ND3, ND4L, ND4, ND5 and cytb genes encoding the respiratory complexes I and III (Supplemental Information). The Cizhutuo individual lived in a subtropical environment during the last glacial maximum, while present-day pandas live in a temperate environment . That, along with a colder climate across East Asia around 200 kya  when their populations likely diverged, might have played a role in the diverging histories observed in their mtDNA lineages. Adding more ancient data, particularly from the nuclear genome, would help to further clarify both the population history and environmental adaptations of ancient pandas. We thank Hongru Wang for helpful discussion and comments, Matthias Meyer and Birgit Nickel for technical help, the Beijing Caver for discovering the specimen, Yong Xu for his help in editing images and Wanjing Ping for administrative aid. This work was supported by: Chinese Academy of Sciences (XDB13000000), NSFC (91731303, 41672021, 41630102), Chinese Academy of Sciences (QYZDB-SSW-DQC003, XDA19050102, XDPB05), National Key R&D Program of China (2016YFE0203700), and the Howard Hughes Medical Institute (grant no. 55008731). Y.Z. is funded in part by the fund “Paleontology Fieldwork and Fossil Preparation”, CAS. Q.F. conceived and designed the study. A.M.S.K. and Q.F. performed the analysis and wrote the manuscript. Q.F., Y.Z., Y.H., P.C., X.F., L.Z., and F.W. performed sample collection, experiment and data processing. A.M.S.K. and Q.F. performed data analysis. A.M.S.K., M.A.Y. and Q.F. wrote and revised the manuscript. All authors read and approved the final manuscript. Hu, Y., Wu, Q., Ma, S., Ma, T., Shan, L., Wang, X., Nie, Y., Ning, Z., Yan, L., Xiu, Y. et al. Comparative genomics reveals convergent evolution between the bamboo-eating giant and red pandas. Wei, F., Hu, Y., Zhu, L., Bruford, M.W., Zhan, X., and Zhang, L. Black and white and read all over: The past, present and future of giant panda genetics. Zhu, L., Hu, Y., Qi, D., Wu, H., Zhan, X., Zhang, Z., Bruford, M.W., Wang, J., Yang, X., Gu, X. et al. Genetic consequences of historical anthropogenic and ecological events on giant pandas. Fu, Q., Meyer, M., Gao, X., Stenzel, U., Burbano, H.A., Kelso, J., and Paabo, S. DNA analysis of an early modern human from Tianyuan Cave, China. Sawyer, S., Krause, J., Guschanski, K., Savolainen, V., and Paabo, S. Temporal patterns of nucleotide misincorporations and DNA fragmentation in ancient DNA. Abella, J., Alba, D.M., Robles, J.M., Valenciano, A., Rotgers, C., Carmona, R., Montoya, P., and Morales, J. Kretzoiarctos gen. nov., the oldest member of the giant panda clade. Qi, G., Dong, W., Zheng, L., Zhao, L., Gao, F., Yue, L., and Zhang, Y. Taxonomy, age and environment status of the Yuanmou hominoids. Dong, W. and Qi, G.Q. Hominoid-producing localities and biostratigraphy in Yunnan. Wang, S., Xu, X., Shrestha, N., Zimmermann, N.E., Tang, Z., and Wang, Z. Response of spatial vegetation distribution in China to climate changes since the Last Glacial Maximum (LGM). Qi, B., Hu, D., Zhao, X., Zhang, X., Zhang, Y., Yang, X., Zhao, Z., and Gao, Xi. Fossil sand wedges in the northern shore of Qinghai Lake: discovery and paleoclimatic implications.